The finalists of the first Hampshire Women’s Business Awards have been announced. The awards include eight categories that acknowledge creativity, community, business enterprise and excellent service. Bay Leaves Larder, which is run by Sarah Guilder and based in Chandlers Ford has been named as a finalist in Beautiful Bricks and Mortar Business. 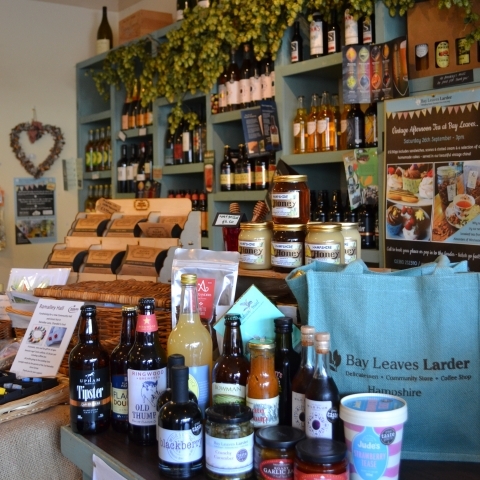 Sarah explains more about her business: "Bay Leaves Larder is a delicatessen, community store and coffee shop on Hiltingbury Road in Chandlers Ford providing a friendly, personal service. We stock and serve a wide selection of fresh, local, organic, gluten free and fairtrade products. We are also a local craft gin specialist. Create a personal present for someone special with our bespoke hamper and food gift service. Choose from a hamper or a pretty jute Bay Leaves Larder bag, and make your selection from our tempting products. We stock a huge variety of Hampshire Fare and Guild of Fine Food 'Great Taste' award-winning foods along with local craft gins and ales." In total more than 100 businesses from around the county were nominated across the eight awards. The Awards are being organised by Trudy Simmons who runs the Hampshire Women’s Business Facebook group. She said: “Female entrepreneurs need to be celebrated – as women we do not shout about our achievements enough. I would like to congratulate all our finalists. Each one of them demonstrates exceptional work ethic, excellent service and a great business mind. I have been so pleased with how many entries we received and how many votes were cast. The Awards night, which is a sold-out event, will take place on Saturday 17 November 2018. Bay Leaves Larder delicatessen, community store and coffee shop.